Product #22129 | SKU 20223 | 0.0 (no ratings yet) Thanks for your rating! 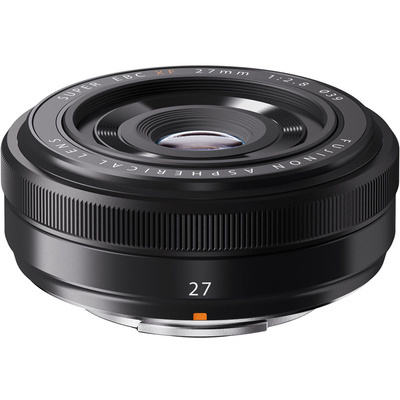 The black XF 27mm f/2.8 Lens from Fujifilm is an extremely compact (61.2 x 23mm), lightweight (78g) prime lens with a versatile 35mm equivalent focal length of 41mm. It provides a 55.5° angle of view. The lens has a maximum aperture of f/2.8 and is effective in low light situations and able to create a shallow depth of field. The lens stops down to f/16 in 1/3 EV stops. A particularly compact and lightweight "pancake" lens, it is ideal as an everyday prime lens and fits well with the form factor of the Fujifilm X-series mirrorless cameras. A built-in high-torque DC coreless motor provides fast and accurate autofocus. Fujinon's HT-EBC lens coating minimises flares and ghosting.